If you've spent enough time at a university, you'll have come into contact with the "Office of Technology Commercialization", "Office of Technology Licensing", or someone responsible for what's called "technology transfer". Essentially, these people are responsible for finding problems that can be solved using technology created by the university and making that technology available to the right people ... for a fee of course. If this surprises you, consider reading the primer offered by Stanford's OTL. The Bayh-Dole act specifically intended to make federal government funded technology more accessible. So what's this got to do with tag clouds? Well, just think about thousands of people walking around, some with ideas, some with solutions, some with problems ... we know they don't use all the same terms, so how can these people find each other productively? Think about why Google offers search suggestions. You may be looking for "software", but I might always refer to "algorithms" or "programs". That's the power of a tag cloud. When words are placed out of context, the brain is probably forced to be more open about interpretation. The nice people at iBRIDGE know this (or unknowingly benefit from it). Try it out. 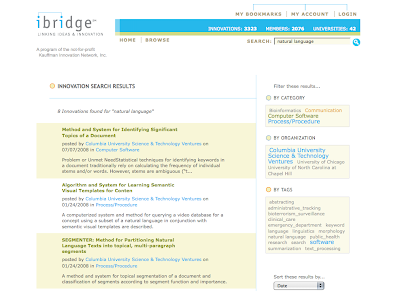 Try searching for "natural language" and see how the tags to the right help out. For another example, look at Nestlé's US and EP patent filings. You could either scan 1,436 entries to find references to "ice cream", or you could simply click "ice", "cream", "confection", or "frozen". So here's my question: why don't other technology search sites like yet2.com, e-ip.com, etc. use tag clouds? Don't make me click through pages of results -- give me a tag cloud!